This step-by-step guide shows how the roof space in a 1950s bungalow was converted to provide two bedrooms and a shower room — all at a cost of $35,000 (which, according to a recent valuation, has added $55,000 in value). Most of the work was carried out by the homeowner, and the author, with expert help for some of the trickier tasks. Use this article as a guide to schedule your own loft conversion. It is always best to check with your local planning department to clarify the above. 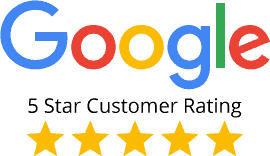 Regardless of whether it needs planning approval, a loft conversion will require Building Regulations approval. This bungalow was built in 1959. The new owners bought the property in 2001, and the interior required considerable updating, which was done on a limited budget. 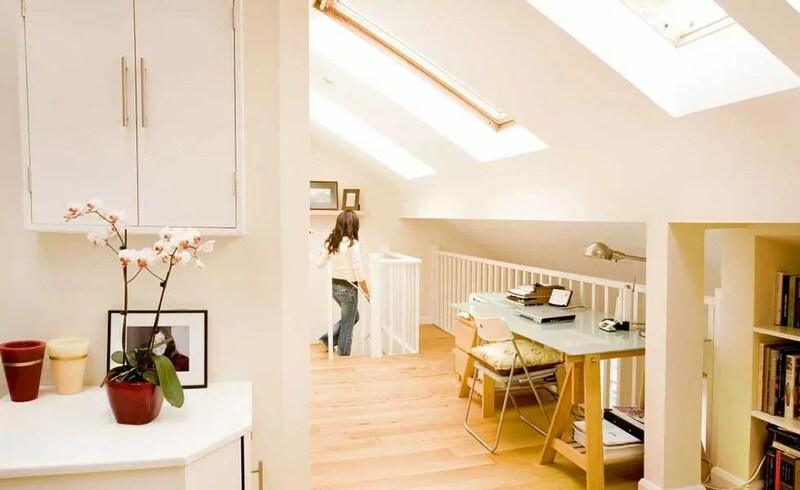 In 2008, with a baby on the way, the owners decided to look at the option of using the loft to increase the living space. This project is used as an example of the process of conversion. An inspection of the inside of the roof space will provide information as to its suitability for conversion. The main features to initially consider include height, access and obstacles. Here, a water storage tank and chimney stacks formed the main obstacles, but the height and pitch suggested that conversion was possible. An architect or surveyor will confirm the loft’s suitability for conversion. It is also necessary to take into account whether the building will be adequate to take the added load of a conversion. Following this, plans are drawn which also provide a basis for cost analysis, and what tasks can be done on a DIY basis. With Building Control approval, work can be started by clearing the loft space. In this example the water storage tank was redundant because a new combi boiler was fitted. If this is still required then it will need to be moved to a convenient space to the side. Two chimney stacks were removed. The electrical wiring and other services that are attached to joists and binders must be removed and rerouted. It provides a good opportunity to replace and improve the original wiring. This requirement is likely to mean that some services may not be available until the new wiring and any pipework can be replaced. The new floor joists can now be fitted. The actual sizes will depend upon the spans, but might typically be 50mm x 220mm C24 or C16 timbers spaced at 400mm intervals. Where there is a window or door opening below this is bridged by doubled-up timber suspended between doubled-up joists. The intermediate joists are attached to the window bridge using joist hangers. New wiring and any required pipework can now be installed. 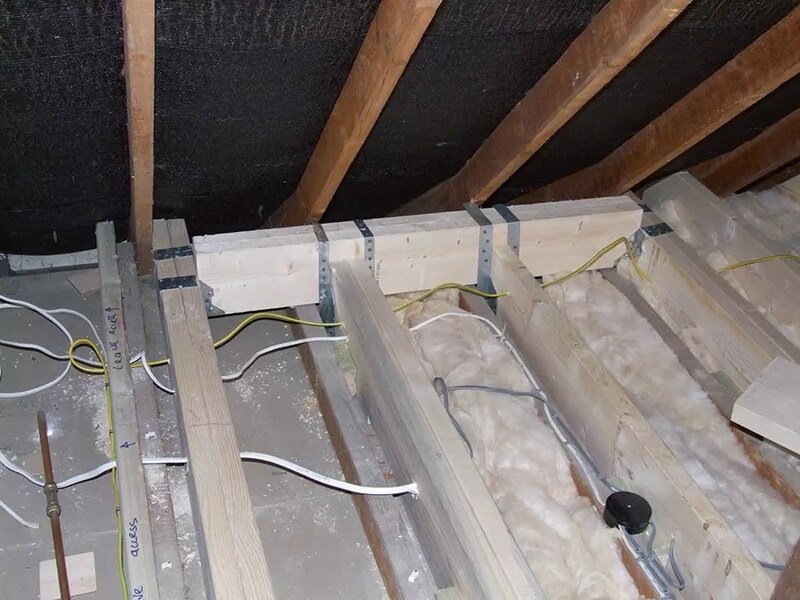 The spaces between the joists are filled with insulation to a depth of 100mm. Following Building Control inspection, the joists can be covered with floorboards. The roofing struts and hangers are temporary but securely reinstalled until suitable replacement arrangements are in place. The tongue-and-groove chipboard floorboards are held in place with screws. A water-resistant grade is a good choice, and essential in the bath or shower room. Work can now be started in rafter reinforcement in accordance with the structural requirements, so that the purlins, struts and collars can be safely removed. This will open up the area. Dormers can now be installed. This will involve opening up the roof, so dry weather is desirable to avoid the risk of water damage. The Building Control officer will inspect to ensure that the roof structure reinforcements are as specified. Two end dormers were fitted, and a mid dormer that is destined to be the shower room. Roof windows are an effective way of letting in natural light. In this project a roof window was fitted above the stairwell. These require the surrounding timbers to be reinforced but are easier to fit than dormers. 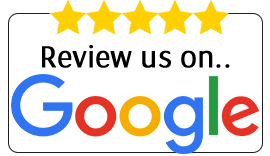 The point at which the staircase is fitted will depend upon individual circumstances, but when in place will give easier access to the loft area. In this example the hallway was widened by knocking down a non-loadbearing front room to the hallway wall and rebuilding the wall 450mm into the front room. The dormers are tiled and clad to fully weatherproof them. 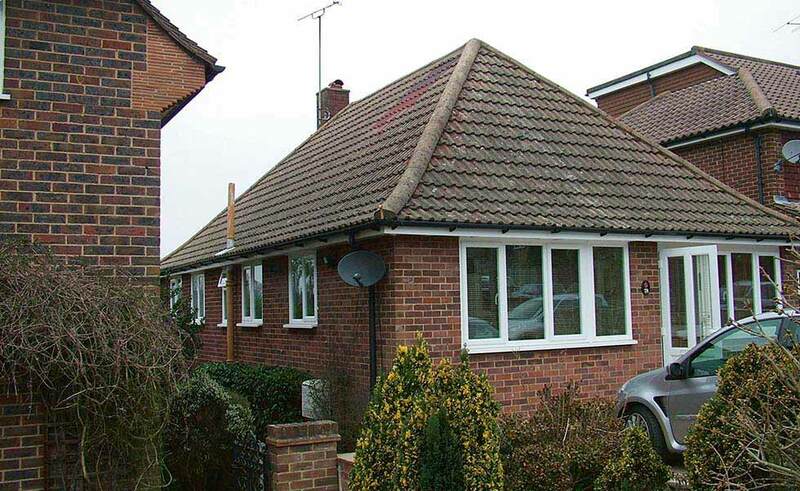 The end dormers in this example have tiled roofs and tile cladding, whereas the shower room has a felted flat roof and tile cladding. Scaffolding will be required for safe working. 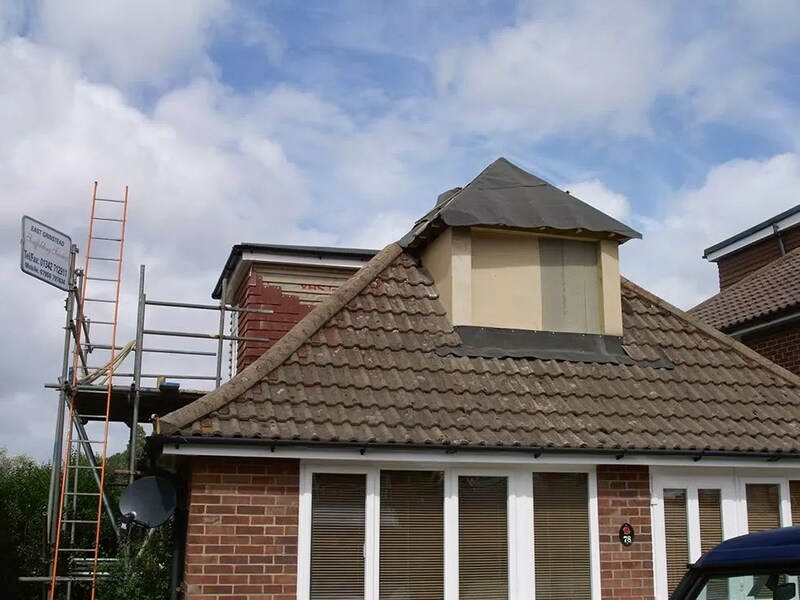 Ridge and soffit vents are fitted at a convenient stage. The windows are fitted in the dormer openings previously accurately measured. PVCu Class ‘A’ windows were fitted here with an egress hinge on the side-opening sash to provide a good fire exit. Insulation is placed between the rafters, with a 50mm air gap between the roofing felt and the insulation, for ventilation purposes. Over this is further insulation giving a total of 100mm. In the roof space above there is 300mm of mineral wool insulation. Building Control inspection is required before the rafters and insulation are covered. The partition walls are erected. These use 47mm x 100mm timber studs at 400mm centres, with additional noggins. 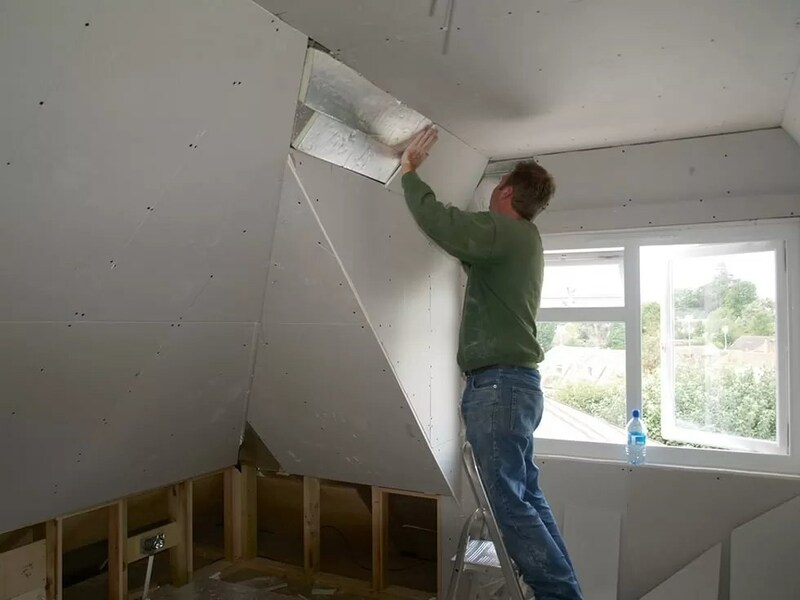 A quilt is placed within the spaces between the studs as the plasterboard is attached. Wall plates fitted between studs will provide a secure fitting to items like radiators; they can also be used to secure the boxes required for electric sockets and switches. This is an ideal time to do the first fix electrics and plumbing. The new electrics must conform to Part ‘P’ of the Building Regulations and the 17th Edition Electrical Regulations. It may be necessary to fit a new consumer unit, or additional unit if the existing one has no extra capacity. Access panels are a useful addition. 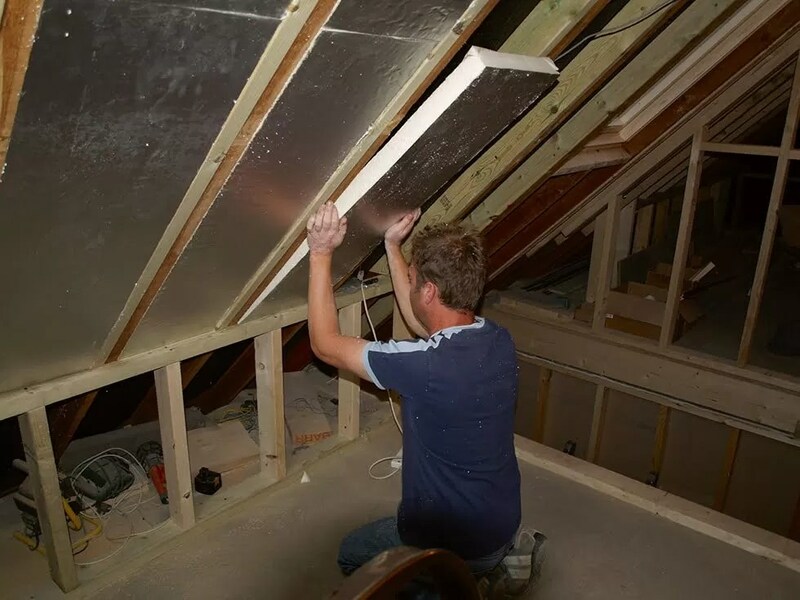 Here, water supplies and central heating feeds can be connected to the loft conversion. All metal pipework is earth-bonded together. Plasterboard attached to the studs and rafters with drywall screws will provide the basis for the decorative plaster skim. Following this, the area is painted as required, and door architrave, skirting etc. fitted and painted. 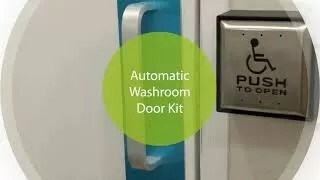 The shower room walls are best clad with a cement-based aquaboard, first ensuring that all the required wall plates are fitted, and that all the required services are accessible. The shower room also requires an extractor fan. With wall and floor tiling complete, the shower room items can be positioned and fitted. Second fix electrics and plumbing is progressed at a suitable time. The radiators are fitted in place, and connected to the central heating system. This picture also shows cupboard doors fitted to make use of the area behind for storage. Finally its time to decorate. The space is now ready for decoration. A step-by-step showing what to expect when your loft is converted. 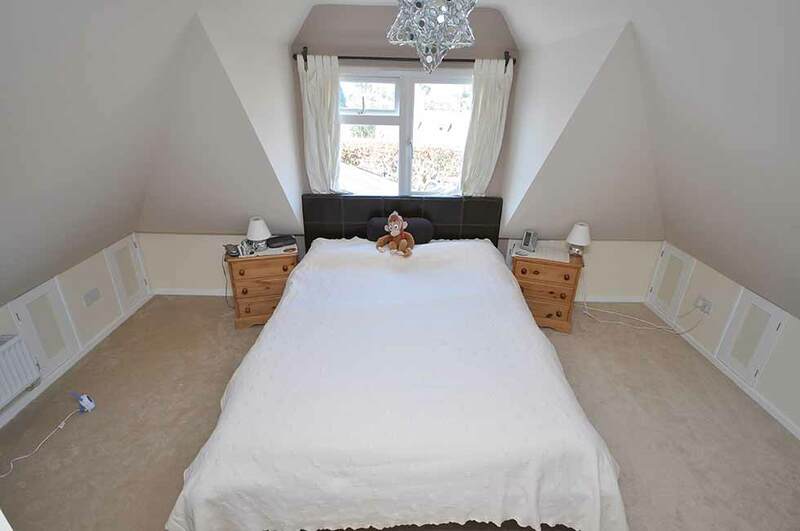 Do I Need Planning Permission for my Loft Conversion?